This painting is on the wall of NEW CREATIONS STUDIO, INC. (hair and nail design boutique) 11 South Decatur Street, Strasburg, PA 17579. Jesus Christ is the Tree of Life, the Lion of Judah and the Lamb of God who is the only complete righteous sacrifice worthy to take away our sin. 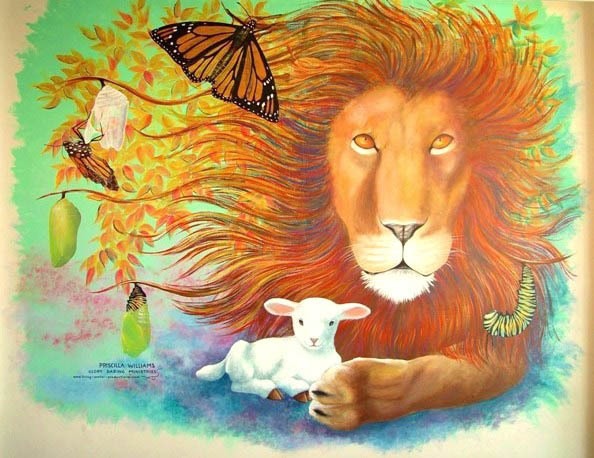 The tree, the lion and the lamb can be representations and characteristics of Jesus Christ. The whole metamorphosis sequence also speaks of who Jesus Christ is. He is the Resurrection and Life. He makes all things new, not just a little change but a completely new creation in Him. The very essence of one changes when receiving the gift of forgiveness and life through the death and resurrection of Jesus Christ. The lamb can also be those who are in Christ Jesus. He is also the Good Shepherd. He is quite capable of caring for us sheep. He has the size and the power to protect us. We are in His good and wise care. We can rest in His peace. The metamorphosis of the Monarch butterfly can also represent the stages of coming to our authentic unique self through our Redeemer. First stage is about the willingness to connect with Him and see life from another perspective. Second stage is about entering the unknown, going into that hidden place for a Season, letting go of attempts to control, shape and design the future or even these days in this stage. The head/mind is already in a no return to the old perspective place. Third stage is when there is no sign of life or fruit or productivity. One may feel completely invisible or hidden. It can feel like one is dying. It can be a very dark time. All kinds of fears may be flushed out at this time. Nothing is the same. Life as was known is over. Fourth stage depicts the struggle to be very real and integrated with greater potential for flight than any other stage. This new creature is perhaps conscious of not understanding what just took place or just how different it really is now. There is a certain amount of exhaustion that causes the new creature butterfly to wait and rest at this juncture, getting oriented to life outside the cocoon in a whole different world. Its wings slowly start to stretch. Fifth stage brings the new creature to a readiness to become the butterfly intended. It is its DNA Design. How does the once caterpillar know flight dynamics? Flight is inherent in that lowly creature. The caterpillar had to let go and let the destined design for it take it through all those mysterious stages in order to get the great joy of flight, having perceptions from the heights, opportunity to smell and taste the flowers from on high. All these stages represent the life of the follower of Jesus Christ. With His generous, resurrection grace power we are raised from the life of animal instincts and reactions into life in the heights with elevated perspective. The flight elevation gives us opportunity to make so many better choices in life, yielding much better results in all areas of life. My life has been radically changed by this One called the LIFE CHANGER.